This is a traditional style, quality, finely woven cotton shakuhachi cleaning cloth, with a string and a nice stainless steel weight. A cleaning cloth is essential for keeping the bore of the shakuhachi free of moisture, dust and dirt. Comes complete with instructions on how to tie a removable knot onto the cleaning cloth. 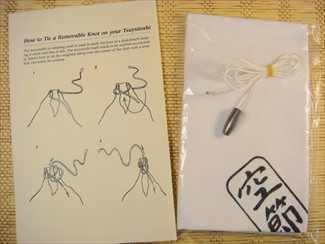 As shown in the second photo, it is best to pull the cleaning cloth through your shakuhachi from the top downward, in the direction air travels through the bore. 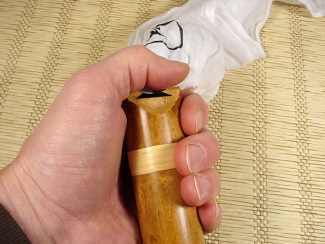 In addition, place your thumb over the utaguchi (blowing edge), so the cloth slides off your thumb rather than rubbing against or catching the blowing edge of your flute. This is a good practice to adopt whether you are cleaning an ABS resin Shakuhachi Yuu or a bamboo shakuhachi.